The living room is the space where much of the socializing happens, so we strive to make it welcoming and cheerful, radiating hospitality and warmth. 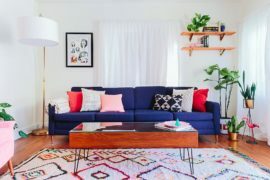 The easiest way to assure your living room gets a strong dose of these traits is to invest in one distinct element that embodies all of them. 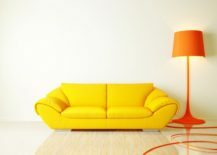 Enter the yellow sofa. 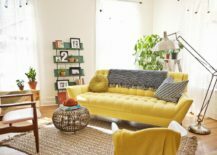 No matter the overall interior of your living room, whether modern minimalist or vintage shabby chic, a yellow sofa will bring so much vibrant character into the space and turn it into the most joyful room of the house! 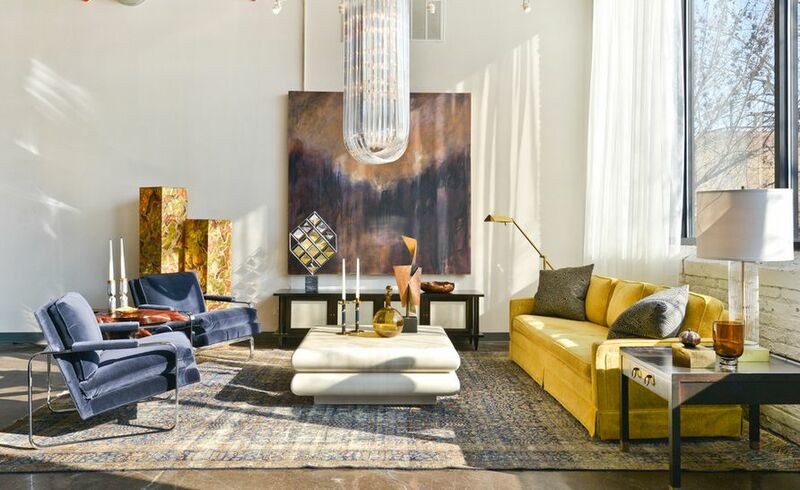 A yellow sofa naturally pairs well with golden elements, so don’t hesitate to add some shiny metallic pieces into the living space! 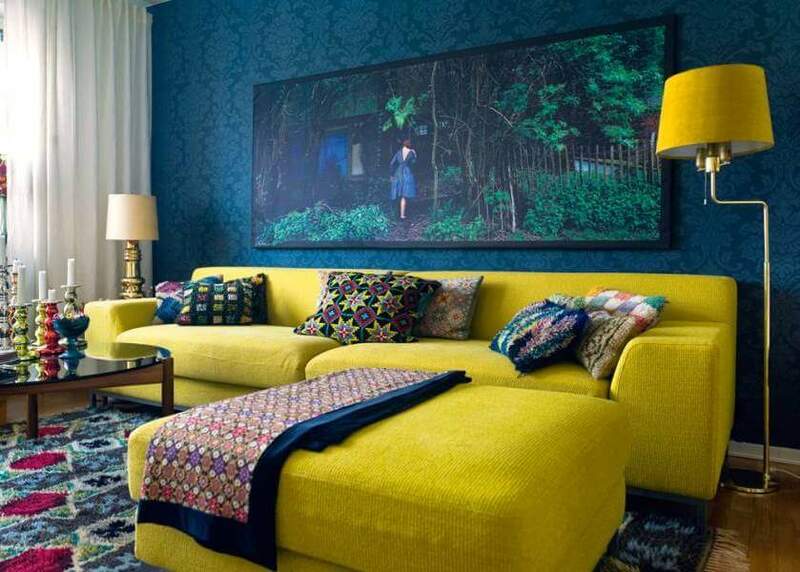 Even in a room with incredible wall art and stunning decor pieces, the yellow sofa visibly stands out! 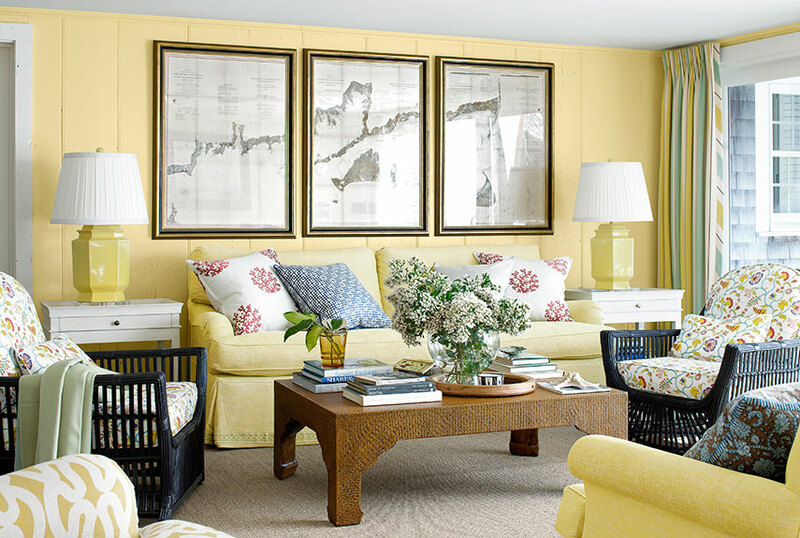 A yellow loveseat is a marvellous piece for an open living room that needs a focal point. It serves as an anchor within a very spacious room and beautifully contrasts the monochrome wall gallery. 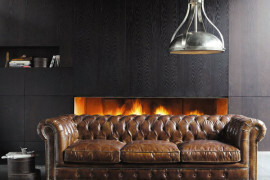 A rustic living room naturally feels very warm and cozy, due to a selection of antique wooden furniture pieces. 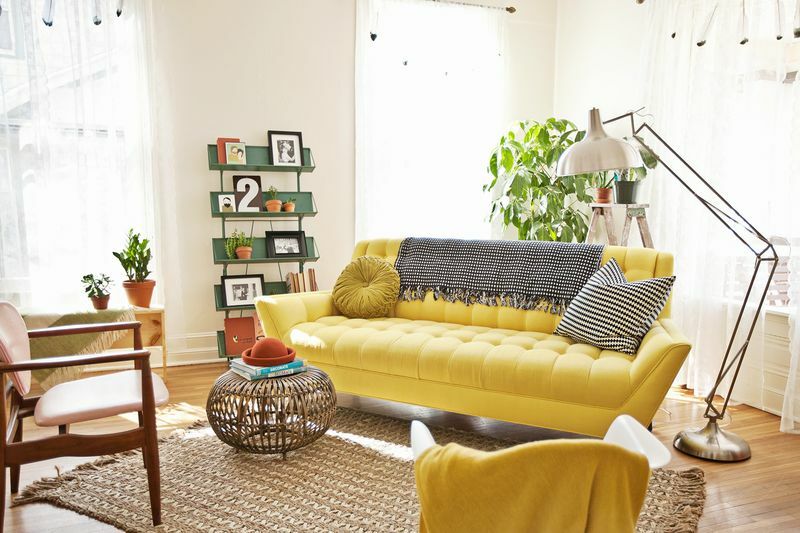 In order to make the space feel even cozier, a yellow sofa is a great choice – particularly when it gets to match the beautiful yellow walls. 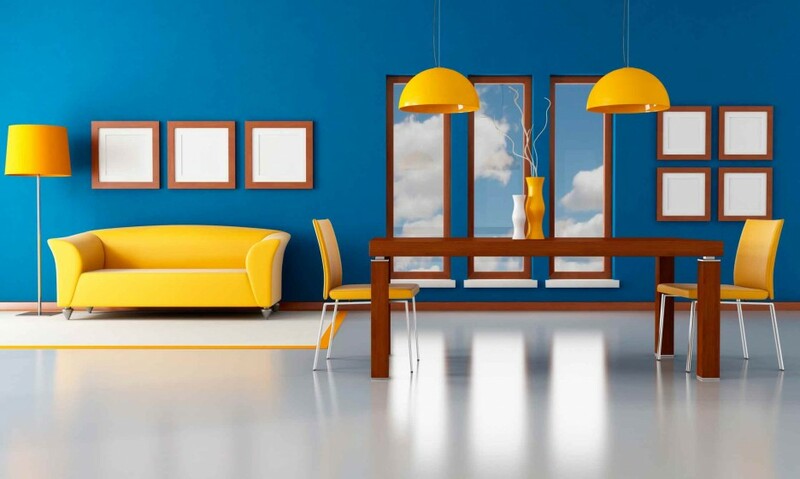 A very bright room needs an element that will bring balance into the space. It should make the room feel less cold and more personal. 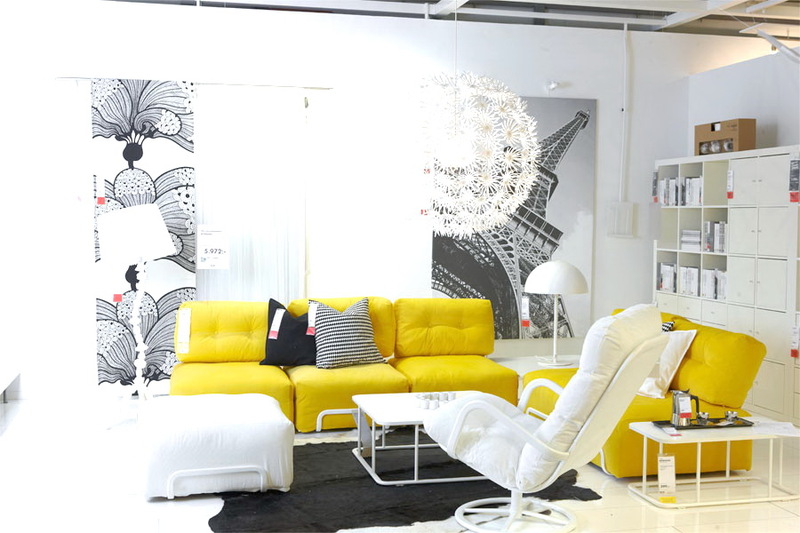 A yellow sofa has a cheerful personality and will be completely enough to uplift the mood in a white living room. 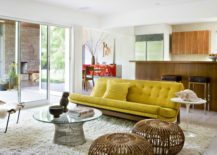 You may think that such a vibrant choice of a sofa has a limited scope of design styles it can be paired with, but allow this living room to prove you wrong! 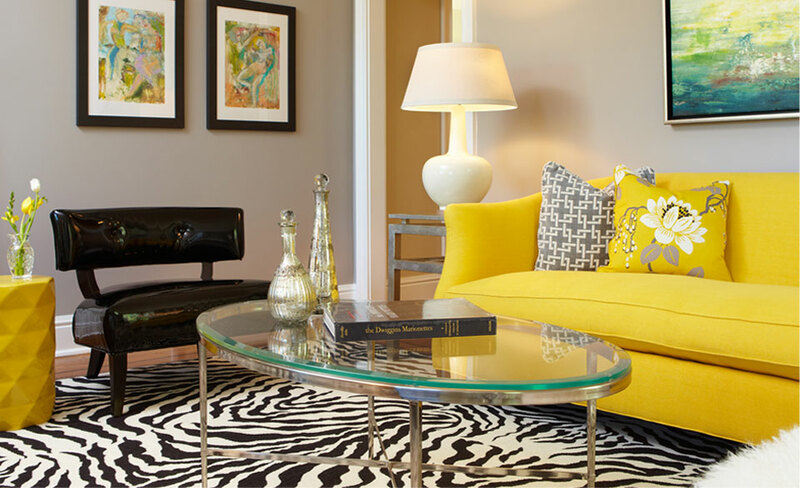 The bold yellow color always stands out and works amazingly with many different decor styles. A living room should always be radiating familiarity and friendliness, inviting you in with furniture pieces that clearly represent joy and cheerfulness. 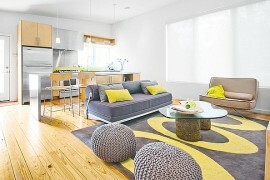 The best way to achieve that is with bright choice of colors, so implementing yellow is the obvious next step! This minimalist living room has a peaceful ambiance, created by a consistent color scheme and a small selection of decorative items. 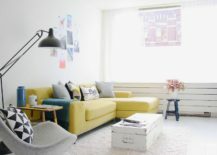 Within such a room a yellow sofa is the one item that embodies dynamic and uniqueness, setting the room apart from other minimalist rooms that can easily get lost in monotony. 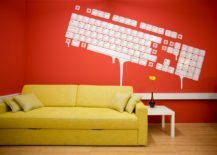 Pairing together bright colors can be the greatest fun of decorating your home, especially if you find unique ways to make the best of a certain color. 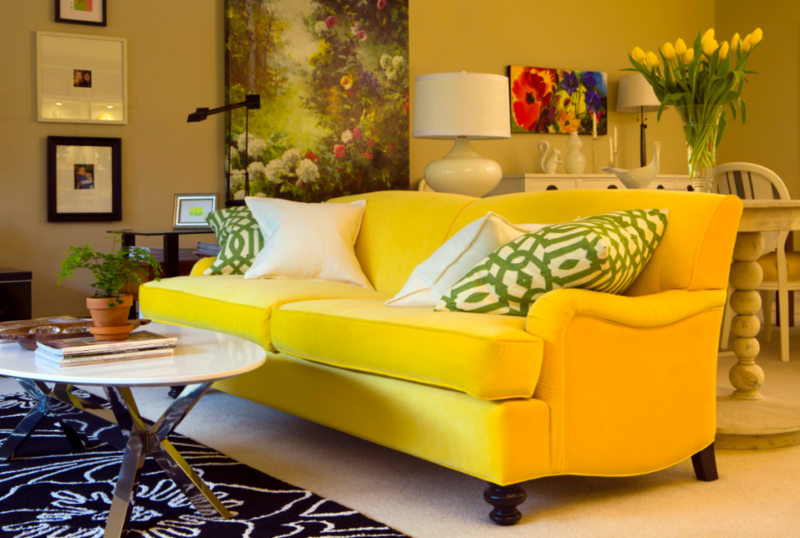 Let the yellow sofa be the center of attention, but surround it with natural green elements such as potted plants. 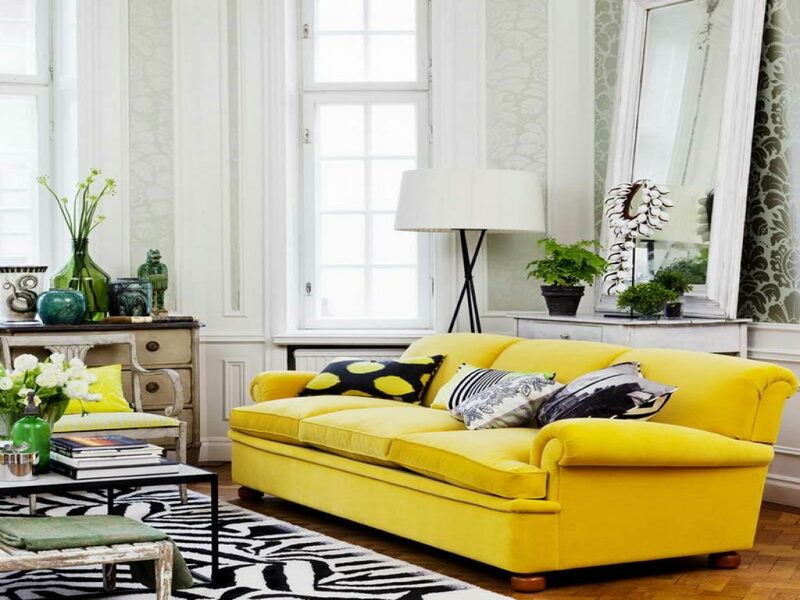 An old-fashioned living room calls for a darker yellow sofa with thick cushioning. Comfort is of the essence and it’s the first thing that we notice when looking at the room. Once you are comfortably seated on the sofa you can start soaking in the beautiful vintage decor and marvellous blue walls. 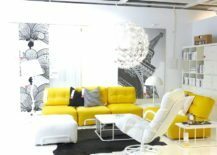 White and yellow seem like the perfect match, as white feels like a backdrop for the yellow sofas that are the absolute focus of the room. 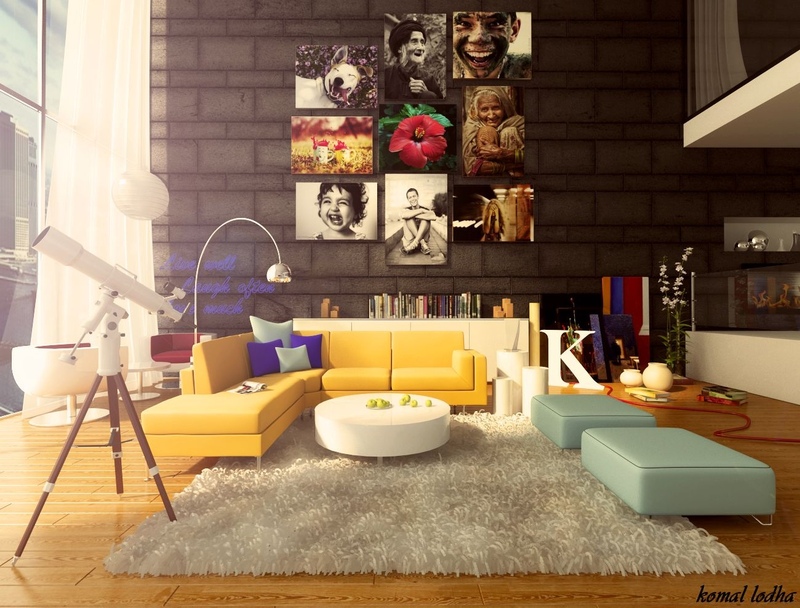 The contrast is very strong and makes the room feel incredibly modern! 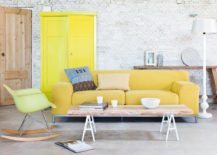 A unicolored vibrant sofa in a cheerful shade of yellow is such a versatile piece that gives you so much freedom when deciding on a backdrop. 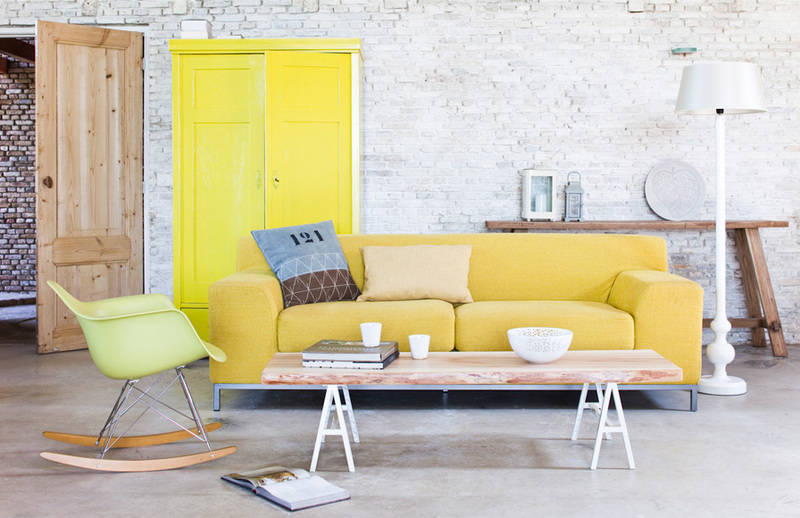 Play around with different backgrounds and watch how the yellow sofa dominates each and every one of them! 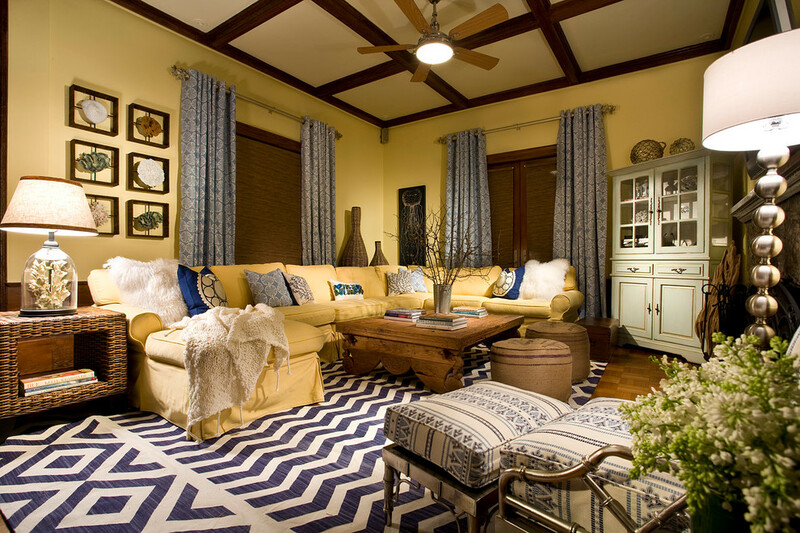 Some living rooms are like a mosaic of different colors and decorative pieces. There is a harmony between warm and cold colors, bold hues and pastel ones. A yellow sofa can be a big contribution with its cheerful character! 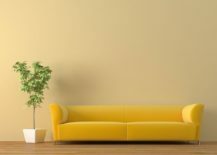 In a living room with several shades of yellow, the sofa can take on the role of being a very important element that contributes to colorful consistency! An all-white living room with a big bookcase strikes us as a big and bright book corner with a giant sofa that can accommodate several family members at once and provides much comfort. 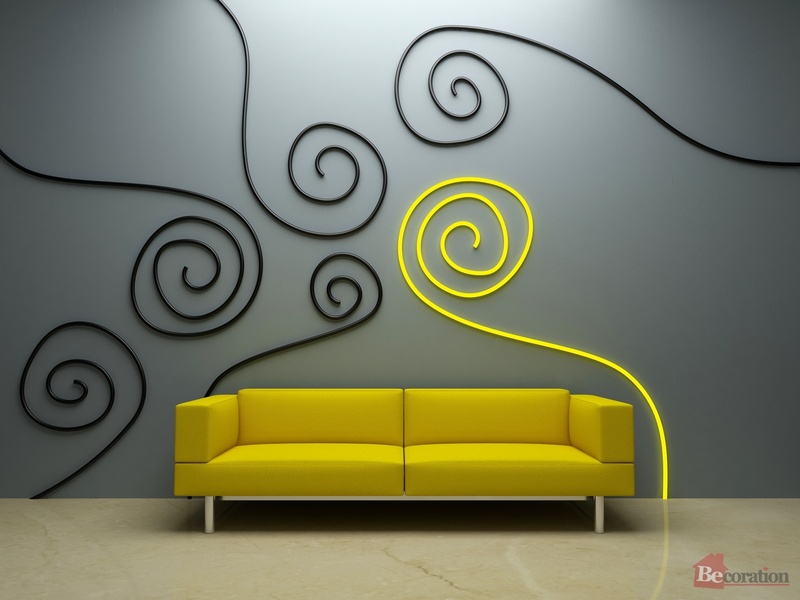 The chosen yellow color gives the room a special charm! Due to their contrasting natures, yellow and blue mix beautifully! 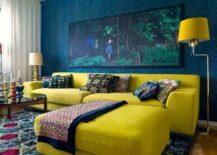 Yellow has a strong energetic component and blue tones down the vibrancy a little bit, helping the room to a balanced interior. 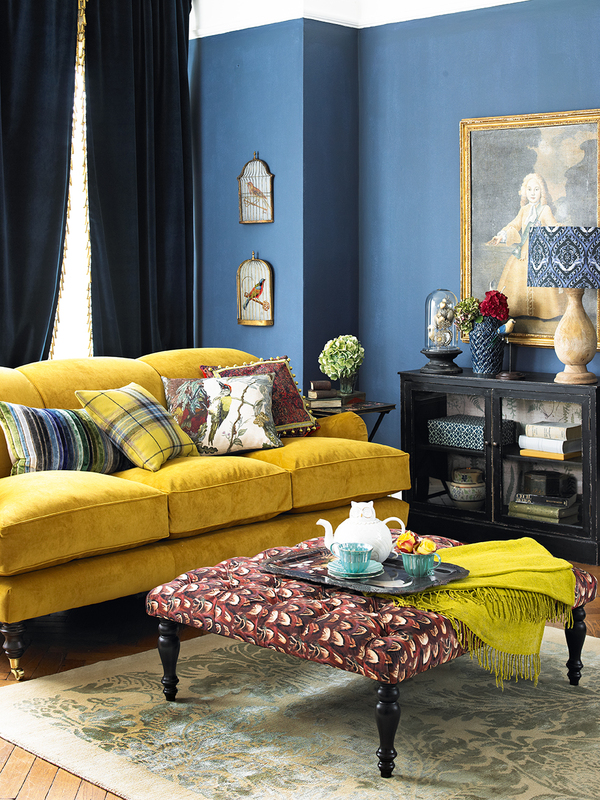 The yellow sofa can find its rightful place even in a darker room with a distinct moody interior. The mystic ambiance is actually enhanced by the presence of yellow! 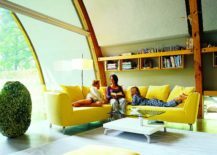 A modern living room that is greatly illuminated by sunlight needs a centerpiece that blends with the natural light and plays a part in keeping the room bright and upbeat. 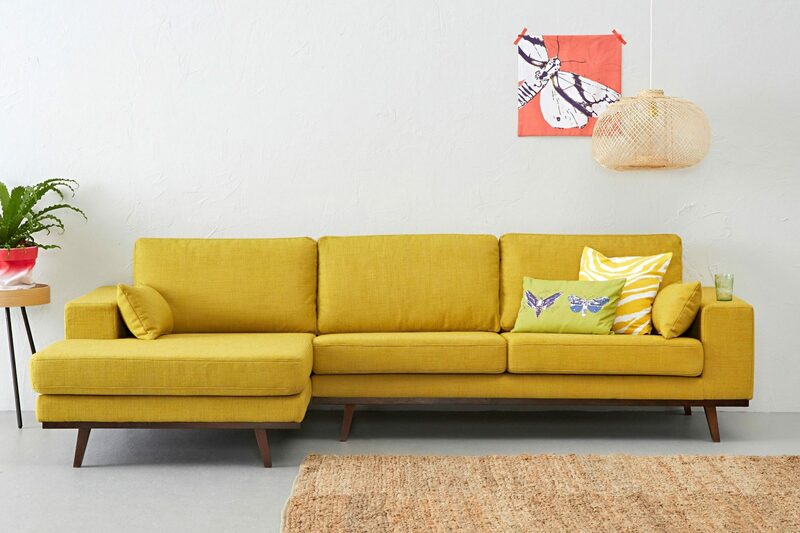 A yellow sofa does just that, along with creating a joyful place for the whole family to hang out at. 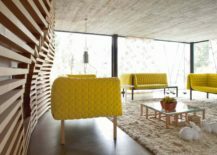 A living room with big sliding doors that make the room open and connected to the outdoors mimics the light yellow shades of sunrays with the beautifully arranged yellow sofas! An industrial room with a rough and bare wall is softened by a long dark yellow sofa that visibly stands out against the neutral backdrop. 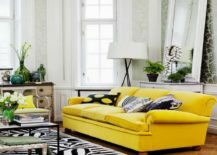 If you don’t like the look of vivid colors that outshine everything else in the room, a calmer hue of yellow is the ideal choice for a sofa in a living room that is going for a calm and steady interior. 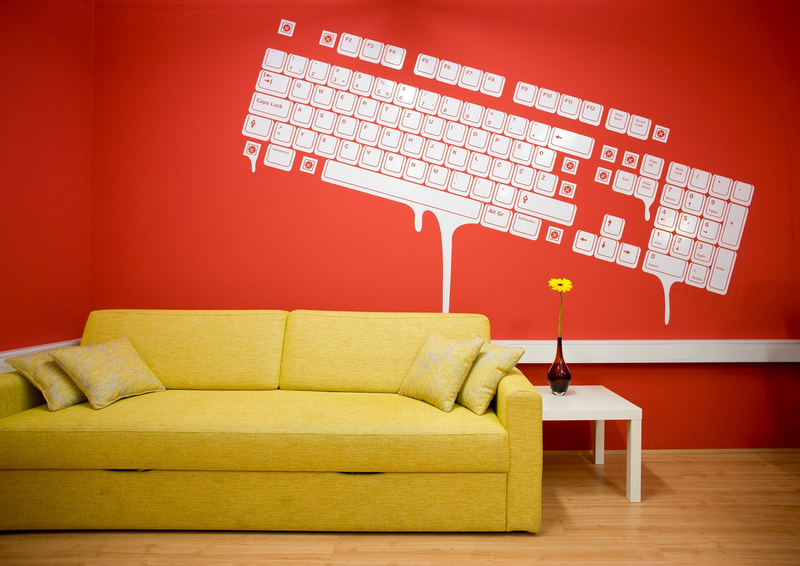 Colors draw attention – the bolder they are, the quicker they’ll catch the eye! 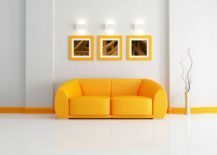 A great way to create a decor that stands out in its entirety is to keep it minimal and pair together two very bold colors, as shown in this living room with a vibrant yellow sofa and an orange lamp. 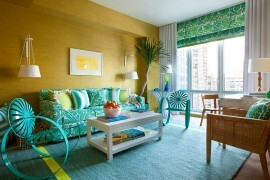 Matching the color of the sofa with other elements in the room creates a consistent interior. When the color radiates confidence and purpose, it’s enough to fill a room without the addition of any other hue. 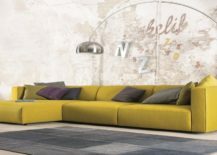 A sofa with a vintage design and bold modern yellow color is the greatest compromise between the two. It will fit right into a living room with vintage interior and also have the power to bring an old-fashioned flair to a modern setting. 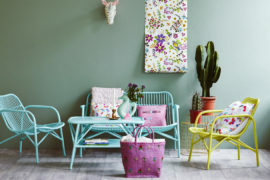 Pastel colors have a retro charm, so dressing up a living room into them is a great way to channel the interior of the greatest eras. 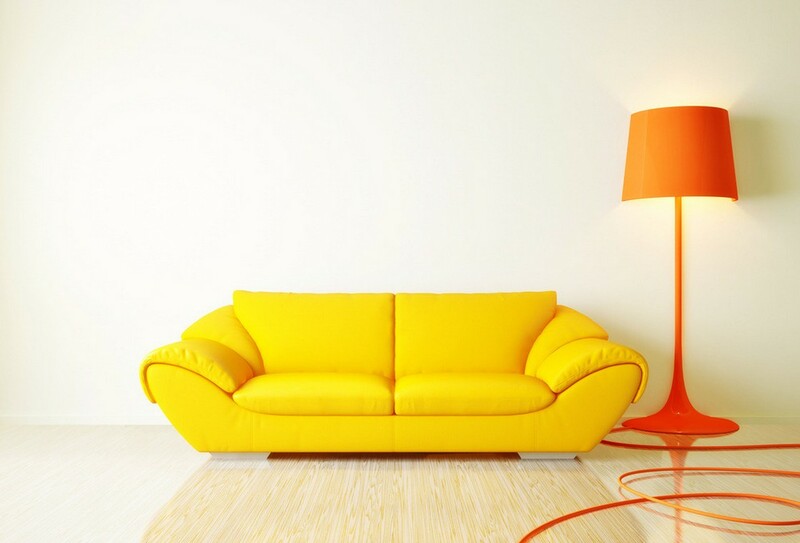 Keep your yellow sofa in the same shade as the rest of the room to create a visual harmony. 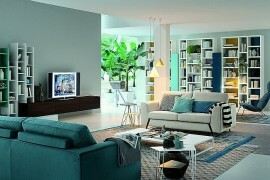 Contrasts work really well in big rooms where the open space carries a lot of brightness and luster. 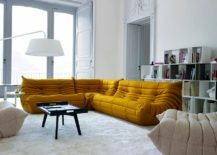 Such a space needs one outstanding element that is the highlight of the room and this gold yellow sofa definitely fits the description! 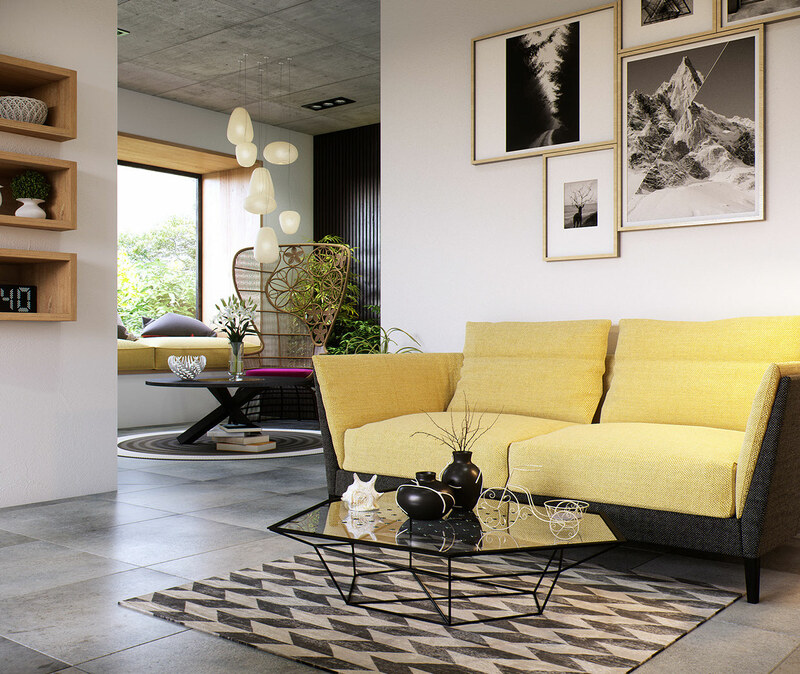 A simplistic wooden interior has a compelling polished design and the yellow sofas help create a modern ambiance where minimalism and liveliness go hand in hand. You can easily add red on the long list of colors that go amazingly with yellow. This room strikes us as dazzling! The clear contrast between the bright red and matte yellow creates a stylish interior where colors are what fills up the space! 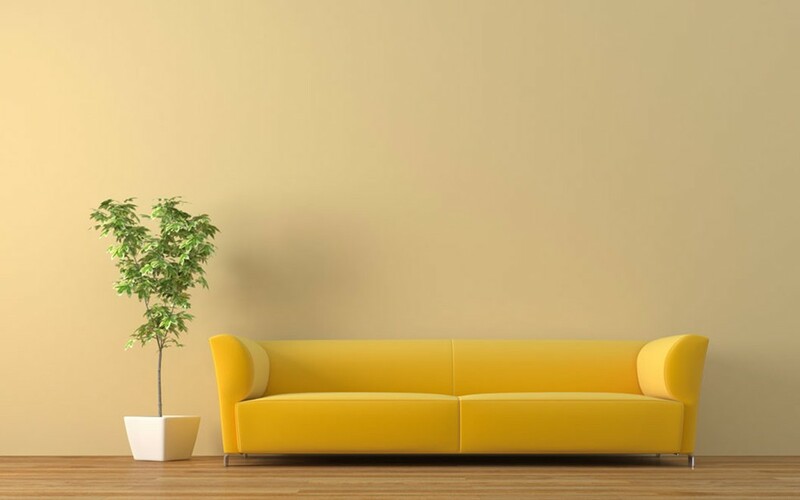 Even with a unique wall decor, a yellow sofa will remain the center of attention. 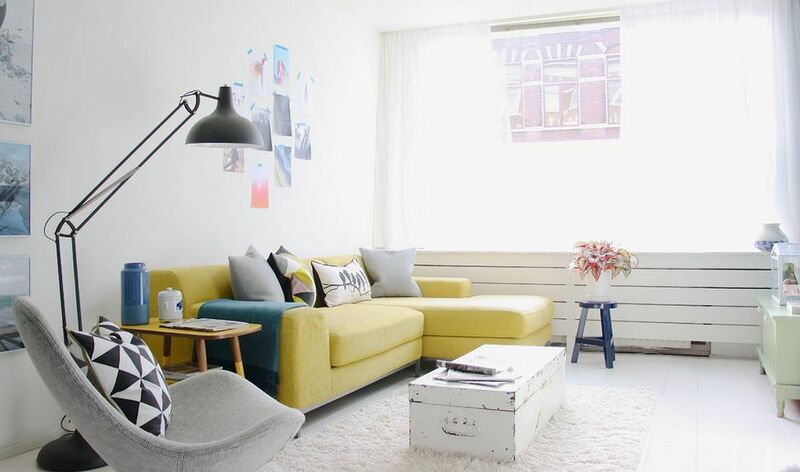 The gray wall could easily affect the room’s mood, but the colorful sofa dictates the ambiance! 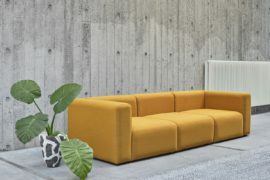 An almost orange shade of yellow is an excellent choice for a modern living room that consists of contemporary design concepts and welcomes dynamic pieces with open arms. If minimalism is your preferred style of decor, sometimes a yellow sofa is all that is needed. It’s the ultimate centerpiece and, aside from a simplistic plant, doesn’t need other elements to make the room complete.